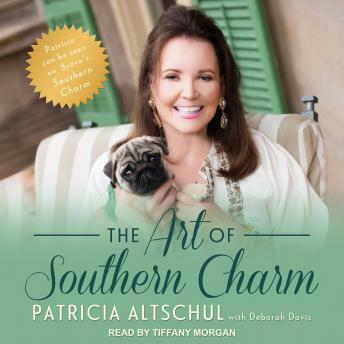 Fan-favorite Bravolebrity Patricia Altschul from the primetime show Southern Charm finally brings fans her eagerly anticipated opus on etiquette and living a glamorous Southern lifestyle. Patricia provides advice on every situation, from hosting a memorable cocktail party, to decoding the dress code for any event, to handling a drunken boor at the dinner table, to delivering the perfectly phrased insult-like her now iconic 'shameless strumpet.' The Art of Southern Charm takes listeners inside the world of Charleston's most captivating grande dame, who (with Michael the Butler) offers a blueblood's blueprint for curating and celebrating life at its best. I love watching Patricia on Southern Charm. Her book was informative and entertaining. It was refreshing to learn that with all of her money and class, she has a sense of humor. I was most impressed to learn that Patricia was a college professor. Oh, and I want a “Michael”...a classy, educated butler that makes a home run like a well-oiled machine. I hope to see more of Patricia on Southern Charm!